This article is organized as follows. In the next section, we present three examples of CSCL macroscripts (in section ‘Examples’). These examples will be used all along the article to exemplify and anchor our arguments about flexibility. We then propose de- finitions for the macro-script notion and list macroscripts important characteristics. In section 3, we deepen our analysis of flexibility. We first dissociate intrinsic constraints and extrinsic constraints. We then analyze what flexibility issues are required for the teacher (in section ‘Why should scripts be flexible?’) and then for the students (in section ‘Flexibility for the teacher’), using the examples introduced in next section to exemplify intrinsic and extrinsic constraints. In section ‘Implementing flexibility’, we define what conclusions can be drawn from this analysis in terms of operationalization platforms. In the field of computer-supported collaborative learning (CSCL), scripts are designed to support collaboration among distant learners or co-present learners whose interactions are (at least partially) mediated by a computer. The rationale of scripts is to structure collaborative learning processes in order to trigger group interactions that may be rare in free collaboration. Fixing the degree of coercion is a delicate design choice: too rigid scripts would spoil the richness of collaborative interactions; too flexible scripts would fail to induce the targeted interactions. Because of the unpredictability of how scripts will be enacted, both the teacher and the students must be allowed to modify some script features. In this article we propose a conceptual analysis of this notion of flexibility, arguing for a dissociation of constraints that are intrinsic to the pedagogical design of the script and constraints induced by the technology or contextual factors. 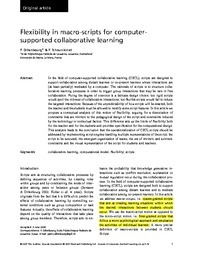 This difference sets up the limits of flexibility both for the teacher and for the students and provides specification for the computational design. This analysis leads to the conclusion that the operationalization of CSCL scripts should be addressed by implementing script engines handling multiple representations of the script: the script to be executed, the emergent organization of teams, the set of intrinsic and extrinsic constraints and the visual representation of the script for students and teachers.